Beauregard, who had been at the Montgomery [AL] Humane Society most of his first year, was very shy. He had been rescued from an abusive home, and so far, no one had adopted him. When the shelter spotlighted him as Pet of the Month on its Petfinder website, his luck changed. 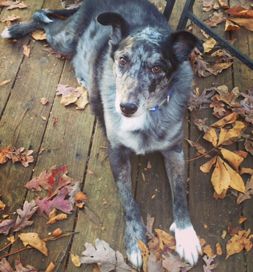 Learn why Petfinder believes all dog should wear tags and collars — like Cooper. Amy Johnson of Birmingham, AL, had always had pets, but when she went to college, balancing work, school and other activities made having a dog seem unfeasible. Then, in her sophomore year, her roommate adopted an Australian Shepherd puppy, Pesto. “I immediately fell in love with her,” Amy says, “but knew I wanted a fur-baby of my very own.” She began watching for that special one on Petfinder. When she saw Beauregard, an Aussie mix, she had to meet him, so she and her roommate drove to Montgomery, taking Pesto along. They led him out, and as he rounded the corner, Amy began to cry. “He was so much more beautiful than the pictures I’d seen online.” She could tell he was nervous, but he “kept his chin up like a brave little soldier,” she recalls. He crawled in her lap, pressed his head against her and began to whimper and wag his tail. She hugged him, and the connection was made. Cooper is twelve now and loves to snuggle and give drive-by licks — kisses to show he cherishes Amy as much as she cherishes him.